This module provides a comprehensive overview of the three main dimensions of the fire environment triangle: fuels, topography, and weather. 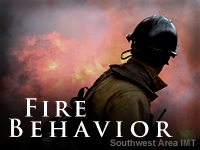 Five interactive case studies illustrate the interdependent influences these three dimensions have on fire behavior. A wide range of fire behavior is also discussed in terms of the environmental factors that support or suppress fire ignition and spread. As part of the Advanced Fire Weather Forecasters Course, this module is meant to introduce forecasters to science of fire behavior. As a former meteorologist and now volunteer fire fighter this was interesting and worthwhile doing even for someone outside the US. Nice to see places named etc. I dont think we have some of the forecast elements such as fuel temperature. Some terminology in the lesson was confusing and could have been more fully developed. I enjoyed this lab just as much as I enjoyed the one regarding volcanoes! I liked the layout of this lesson. The videos in this module are easy to follow if you make the time. 1. Identify key factors contributing to the fuels dimension of the fire environment triangle, including fuel properties, components, complexes, states, moisture levels, and continuity. 2. Identify key factors contributing to the topography dimension of the fire environment triangle, including slope, aspect, elevation, and soil moisture. 3. Identify key factors contributing to the weather dimension of the fire environment triangle, including temperature, humidity, winds, and instability. 4. Given a case situation including descriptions of fuels, topography, and weather, identify the fire behavior most likely to occur.